When St. Paul writes his first letter to the Church in Corinth, he’s writing to a group of relatively new Christians who are growing deeper in faith while also seeing their community grow in both numbers and impact. It’s a letter full of practical instruction about growing our relationship with Christ, and one section begins this way: “Now concerning spiritual gifts, brothers, I do not want you to be uninformed” (1 Corinthians 12:1). In 2016, Church of the Incarnation in Dallas, Texas, conducted a parish-wide survey to help identify areas of needed growth and development among its parishioners. One of the most prominent needs focused on a desire to know exactly where and how they should be serving at and through the church. 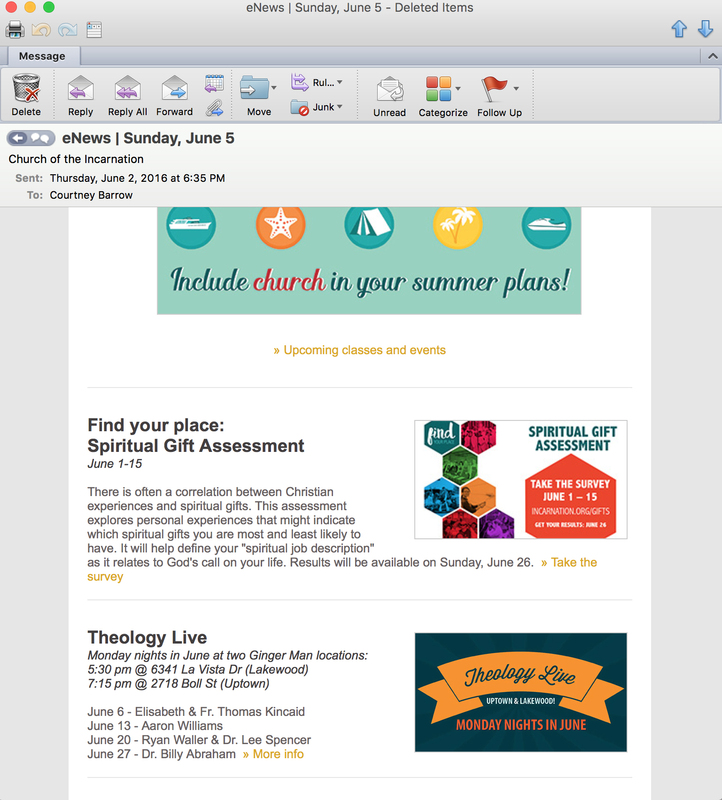 The objective was to provide an opportunity for the congregation to better understand what all of the spiritual gifts are and how God intends them to function in the body of Christ because we are commanded to be aware of them (1 Cor 12:1); we are expected to use them (1 Timothy 4:14); and we will be held accountable for the use of them (1 Peter 4:10). 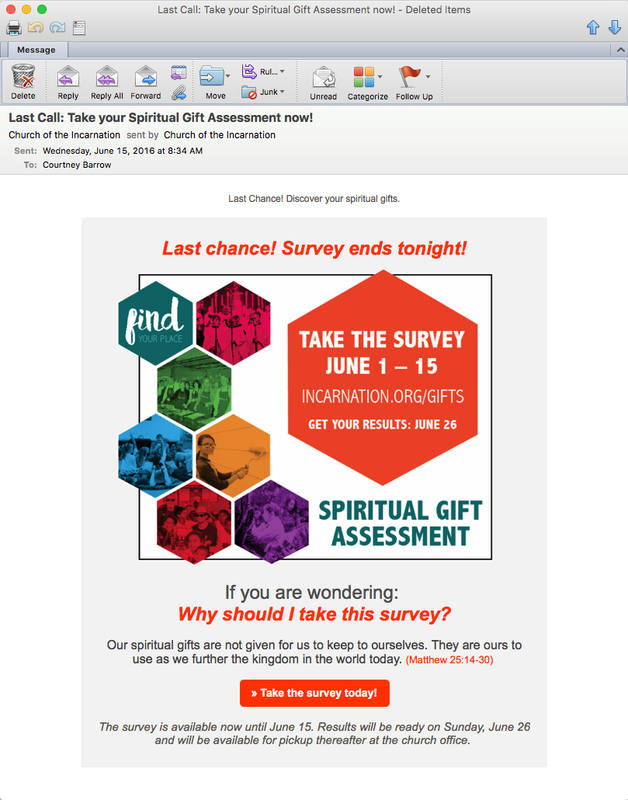 The fact was, many in our congregation weren’t fully informed of their spiritual gifts. The prayer was for that reality to change. 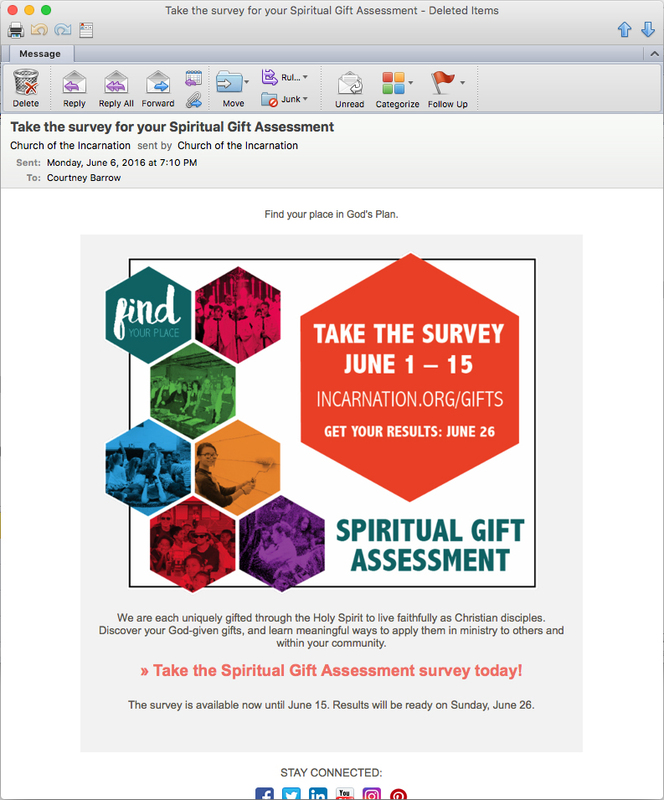 As one may imagine, there is an endless list of printed and digital spiritual gift surveys available in the marketplace. After significant research, the leadership team at Incarnation decided it was best to create its own version, pulling excerpts from existing options while fine-tuning text to be in line with the Anglican tradition. There is often a correlation between Christian experiences and spiritual gifts. This assessment explored personal experiences that might indicate which spiritual gifts someone was most and least likely to have. It helped define their “spiritual job description” as it related to God’s call on their lives. Incarnation tested and described 17 major gifts through this test. The leadership team excluded prophecy, tongues, interpretation, and miracles, primarily because these are difficult to test for and are often self-evident within the context of the local church body. Much of the intellectual property belongs to Bruce Bugbee, author and consultant most known for his work as Pastoral Care Director and leader of the Network Ministry at Willow Creek Community Church. 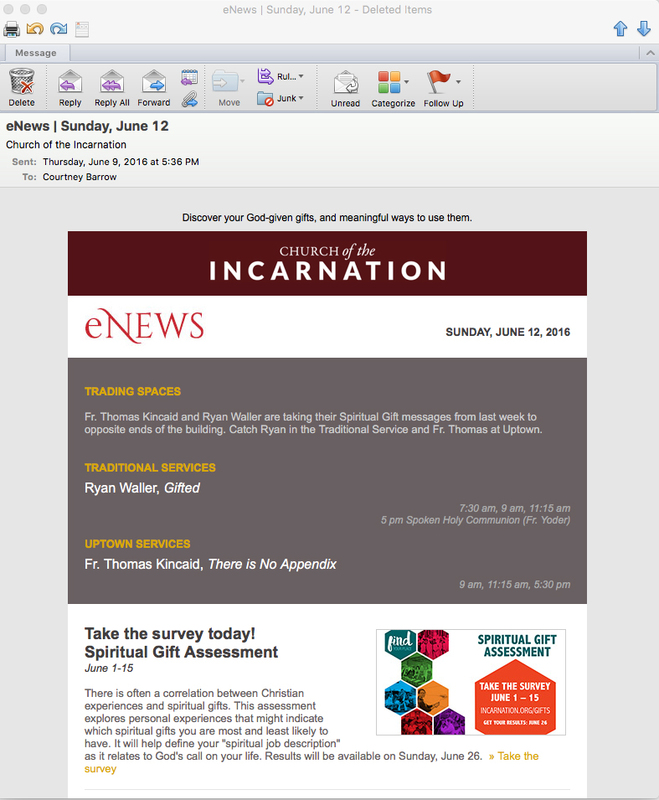 Incarnation decided to exclude a“sometimes”option when answering questions within the survey. We wanted to push people to really think about who they are most of the time - not who they would like to be or how they can be – some of the time. Like most churches, there are many ways to serve in and through Church of the Incarnation. Parishioners were given a personalized spiritual gifts assessment packet that not only revealed their top three spiritual gifts but also equipped them with specific service opportunities in direct correlation to their gifts for them to pray about and consider doing. The packet also included a list of all the gifts that were tested for with corresponding scripture as well as customized prayers specifically for them to use when working through their results. We also held a special commissioning for all who took the assessment during each morning worship service on the Sunday the packets were distributed. Whether they were getting involved for the first time or had been faithfully serving for years, we wanted to pray with and for them as they clarified God’s calling on their lives. Even though the survey was conducted digitally, we chose to distribute the results in person at church on a specified date. While there was some risk in not giving them immediate results, it did not prove to be a deterrent to participation. In fact, we exceeded our goal by 40%. The main reason we chose to control the distribution of results was so that we, too, had a copy of their top three gifts. Most of the online gift assessments available share the results exclusively with the respondent. Our purpose in conducting this survey was to help shepherd our folks when they received the results, not after, especially since we would have been solely dependent on them to come to us. It has allowed us to take a snapshot of the giftedness of our people (which we have tracked in our database) and ultimately created a working lists of teachers, evangelists, administrators, and the like while also identifying the next group of lay leaders to strengthen and grow the church and its programs. And perhaps most importantly, we now use the assessment as a follow-up to all new members. Within the first week of joining, we issue the survey to ensure they have a framework for getting connected and getting involved. The Church has an urgent mission in this world, and the only way we fulfill that mission to the level we need to is through each of us using our God given gifts to the fullest. In other words, we can’t do it without each other. That’s what Paul was telling that fledging church in Corinth, and that’s what he—and God—are calling you and me to realize in our own lives. Jennifer LeBlanc is the former Publisher of D Magazine and currently serves as the Executive Director of Community Relations overseeing communication strategy, welcome and assimilation ministries, and development for Church of the Incarnation in Dallas, Texas.